Encase™ is Protech’s line of thermoplastic powder coatings designed specifically for the finishing of wire goods and other corrosion prone products. Encase™ provides outstanding impact resistance, excellent flexibility, and powerful chemical resistance. When properly applied, Encase™ thermoplastic powder coatings meet the standards of the U.S. code of federal regulations 21CFR175.300, resinous and polymeric coatings, as well as FDA standards for direct food contact. 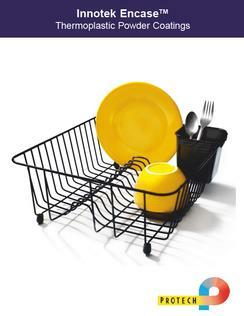 Encase™ is the ideal coating solution for refrigerator and dishwasher racks as well as a wide range of household products. Encase™, like all Protech products, is environmentally friendly and emits no harmful VOC’s.